Eben van der Merwe was born in Bloemfontein in 1932. He was a self-taught painter of landscapes, portraits, figures, still life and abstract pictures. His early work showed influence of Gregoire Boonzaier. 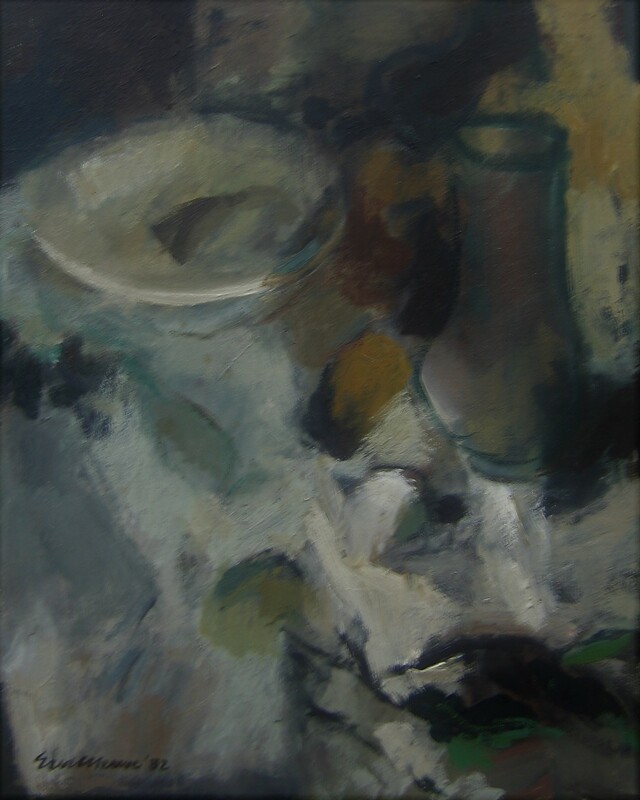 He later moved toward non-figurative composition, rendered his scene in dark, rich colours, broken into segments in the manner of stained-glass. In 1958 a founder member of the Bloemfontein Group. Moved to Johannesburg in 1961, where he worked as a typographer, a visualiser and a designer in advertising agencies, and as art director for the magazine section of Argus Group until 1970. Since 1976 a full-time artist, concentrating on painting and the design and construction of Dalle-de-Verre windows. 1966 travelled to the UK and Europe to study the design and construction of slab-glass windows. 1976 made a study tour of the UK and Europe. The intensity of Van der Merwe’s colour is a distinctive feature of his style: the use, particularly, greens and the counterpoint of vibrant red is not common in SA Painting.